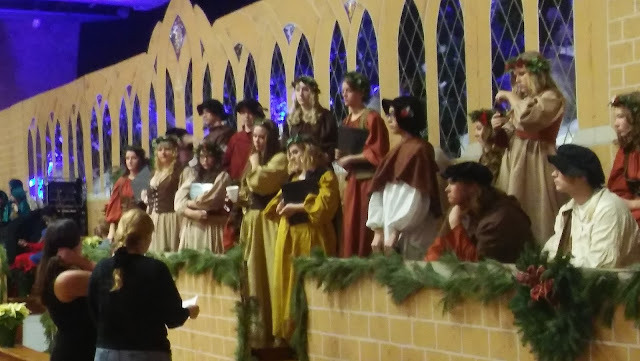 The 41st annual Madrigal Dinner was held the weekend of December 2nd,3rd, and 4th at Metamora Township High School. For those of you not sure, madrigal is a type of song and singing done by a group of men and women usually performed acapella. This type of entertainment came about during the Renaissance period, and the school was “transformed” back to that time. This was the first time I attended the event at this school, and also my daughter’s first appearance in the show as a Court Singer. As we walk down the first corridor we are greeted with the sweet sounds of students playing instruments. It is some of the horn section I see my daughter’s friend C.J. in the group. All the kids look very composed and serious. Up the stairs toward the cafeteria (which is now the castle courtyard) we can hear more sweet chamber music. There is my daughter’s friend Claire playing a gigantic recorder. She is also hard at work. We walk on and can hear caroling ahead. There is my daughter Franchesca singing in the courtyard. Everyone, singers, musicians, and actors are dressed in Renaissance type of garments. They are speaking in an old English language and doing a very good job of behaving regal. The decorations are great. You can tell a lot of effort was put in to make these rooms look like a castle. We make our way over to the door and then seated by the court jester Ish. The room looks like the inside of a castle. There is beautiful tapestry hanging from the ceiling and there are decadent Christmas decorations everywhere. When we are seated our “wenches” tell us we can begin eating our salad and bread. We passed around the salad and my guest cut a slice of bread for everyone from our loaf provided. It took a bit of time and effort but she did it. Thanks, Shirley, nice work. The actors come out and we soon can see what the premise of this dinner will be about. Celebrating Christmas, the prince finding a bride, and some cute funny stuff in between. The queen and prince take their seats and she introduces the Madrigal Singers They proceed to sing a few joyous tunes, The last one being about Wassail, which is a delicious hot apple cider we were served. The queen did a toast and we all drank the Wassail. Next, we are served oven roasted chicken breast and sliced buttery carrots. The chicken was so juicy and carrots we so yummy. I was amazed by this food. Whilst we dine the actors do another bit about the plot line and the Madrigal Singers dazzle us with more angelic sounds. They end on a song about a boar’s head and the actors carry a boar’s head on a platter through the room. Our first plates are cleared away and I see one of my daughter’s friends Faith is one of the wenches. They are all working as quickly as they can to clear and serve the next course. 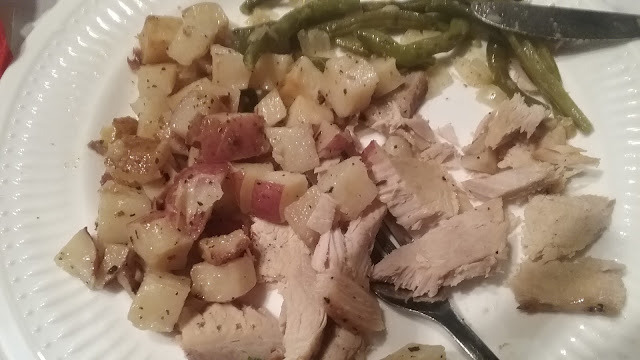 We are then served sliced boneless pork loin, diced baked potatoes, and green beans. Unfortunately, my pork was dry, but being a cook I quickly thought about it and decided to put some Wassail on my meat. It was so good. During this course of the meal, the Court Singers entertained us with some lovely songs. Our seats are so close to the stage and I am thrilled because my daughter is so close. The Madrigal Singers come back in and the Court Singers leave the stage. The play continues on with riddles and jokes and the final outcome of the plot. So funny and sweet. All the kids did an excellent job! 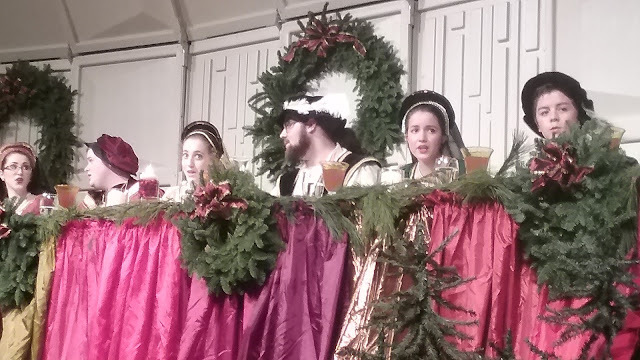 The Madrigal Singers carry on the show and sing a song about bread pudding. We are then served dessert. Warm bread pudding with vanilla sauce. What a huge portion of gooey, yummy, traditional bread pudding. How nice is it to hear songs about food and then be served that food? The singers closed the show with more amazing songs. At the end, the queen asked everyone to join in and sing silent night. All the singers, actors, and musicians held lit candles and we all sang in unison. Wow! An incredible ending to an enchanted evening. I began to tear up at the end. The glow of the candles and the soft gentle singing by everyone was very touching. Reminded me of some great sayings for this time of year. Peace on Earth and Good Will Toward Men. I hope you all experience these things this holiday season. Thank you to all who volunteered, sang, acted, played an instrument, cooked/served food, and directed for this production.